So, this has taken me a ridiculous amount of time to share with you. This was one of my son's two birthday cakes I made for him this past spring (hence the long gone forsythia flowers). I am not sure why it has taken me so long, but finally, here it is. As you can see, this cake method has become a favorite. I absolutely love the exposed layers (I don't have to worry about perfect frosting), unique flavor combinations, and just the pure beauty of it. Yes, it is a lot of work, but I find that it is almost soothing to put these together. And extremely satisfying. Surprisingly, such a small cake will go a very long way. No extra large slices are necessary here! So, let me break this cake down for you, because I know it is a long list of ingredients and directions. But don't let that deter you! It comes together faster than you think. First, this is a very simple yellow cake. But then, you have a homemade strawberry milk that you brush over the cake. Then, some strawberry jam (homemade is better!) is smeared over the milk soaked cake, a strawberry curd is spread over the jam. 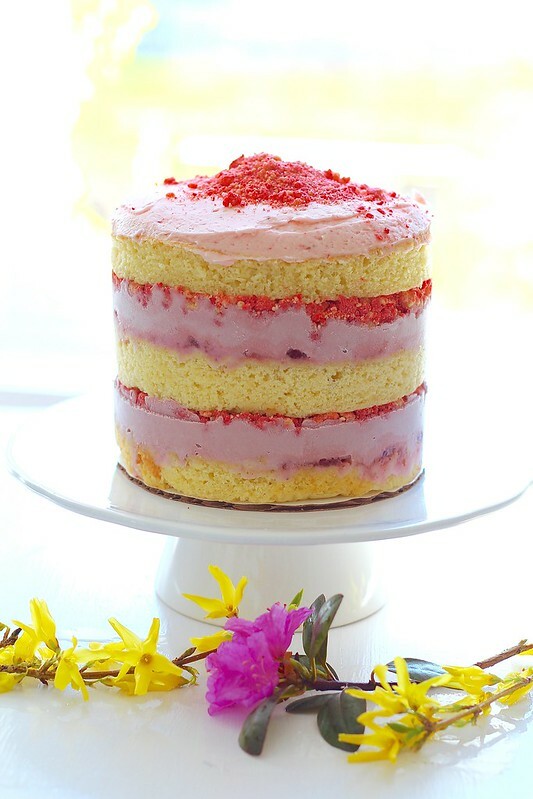 To finish the layers, a freeze-dried strawberry milk crumb is then sprinkled over the layer. Repeat. To finish, a strawberry buttercream frosting is slathered over the top layer and finished with a touch of strawberry milk crumb. Hot damn! Put some time aside this weekend, or perhaps for a loved one's birthday. Or just a day that requires cake. Because we all know cake makes everything better. To make the cake, heat the oven to 350ºF. Butter and flour the edges of a quarter sheet pan. Line the bottom of the pan with parchment paper. In the bowl of an electric mixer, combine the butter and sugars. Beat on medium-high speed for 2-3 minutes, until fluffy. Scrape down the sides of the bowl, add in the eggs, and mix on medium-high for 2-3 minutes more. Scrape down the sides of the bowl again. With the mixer on low speed, pour in the buttermilk, oil and vanilla. Increase the speed to medium-high and mix for 4-6 minutes, until the mixture is nearly white and twice the size of the original batter, and completely homogenous (there should be no streaks of fat or liquid.) Scrape down the sides of the bowl. With the mixer on very low speed, add in the cake flour, baking powder, and salt. Mix for 45-60 seconds, just until the batter comes together. Spread the batter in the prepared quarter sheet pan. Bake for 30-35 minutes, rotating the pan once halfway through baking, until the cake is puffed and the center is no longer jiggly (the cake should bounce back when lightly poked with your finger.) Transfer to a wire cooling rack and let cool completely. To make the strawberry milk soak, place the strawberries and sugar in a blender or food processor. Let macerate for at least 1 hour, until juicy. (You want a lot of juice to release from the strawberries.) Blend the strawberries until completely smooth, about 1 minute. Pour the strawberry mixture into a large pitcher and mix in the milk and buttermilk. Stir well, then place in the refrigerator until ready to use. To make the strawberry crumb, heat the oven to 250ºF. Line a baking sheet with a silicone baking mat. In a bowl, combine the milk powder, flour, cornstarch, sugar and salt. Add in the melted butter and toss with a fork until the mixture clumps together and forms small clusters. Spread the clusters out on the baking sheet and bake for 20 minutes. Remove from the oven and let cool completely. Once the crumbs are cooled, place the freeze-dried berries in a food processor and pulverize until they are a fine powder. Drizzle the melted white chocolate over the crumbs. Add in the strawberry powder, and stir thoroughly with a fork until well coated . Let cool until the chocolate is set. To make the strawberry curd, put the strawberry puree in a blender with the sugar and blend until the sugar has dissolved. Add the eggs and blend on low until the mixture is smooth. Transfer to a medium saucepan, and clean out the now empty blender canister. Place the water in a small bowl and sprinkle the gelatin evenly over the top to bloom the gelatin. In the saucepan, heat the strawberry mixture over low heat, whisking often. It will begin to thicken as it heats up. Once it boils, remove it from the heat and transfer to the clean blender canister. Pour in the bloomed gelatin, butter, and salt, and blend until the mixture is thick, shiny and very smooth. Transfer to a container, cover and refrigerate until completely cool, at least 1 hour. When you are ready to assemble the cake, prepare the frosting. Place the butter in the bowl of an electric mixer. Whip on medium-high speed until smooth, about 1 minute. Add the confectioners’ sugar, salt and heavy cream to the bowl and mix on medium-low speed just until incorporated. Stir in 2 tablespoons strawberry jam. Increase the mixer speed and whip on high speed until light and fluffy, scraping down the bowl as needed, about 3-4 minutes. Taste and add more jam if necessary. To assemble the cake, invert the cake from the sheet pan onto a work surface. Use a 6-inch cake ring to cut out 2 circles from the cake (these will be the top two layers.) Wipe off the cake ring and place it in the center of a sheet pan lined with clean parchment or a silpat. Use a strip of acetate to line the inside of the cake ring. Use scraps from the leftover cake to place in the ring and tamp together in a flat, even layer. Use a pastry brush to soak the top of this cake layer with about half of the strawberry milk. Spread about half of the strawberry jam over the cake. Then, spread about half of the strawberry curd over the cake. Sprinkle with an even layer of the strawberry milk crumb (about one third), gently pressing down to adhere the crumbs to the curd. Gently tuck a second strip of acetate between the cake ring and the top 1/4-inch of the first strip of acetate. 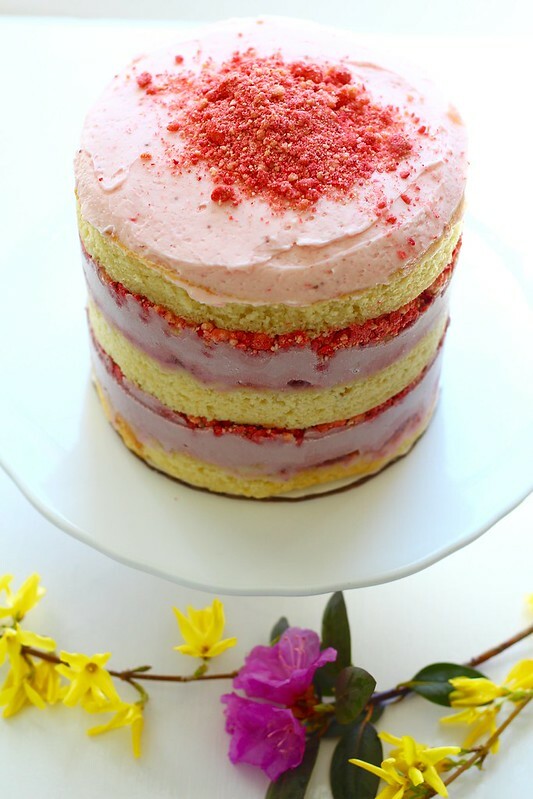 Set a cake round on top of the strawberry milk crumb, and repeat the layering process once more (milk soak, strawberry jam, strawberry curd, strawberry milk crumb.) 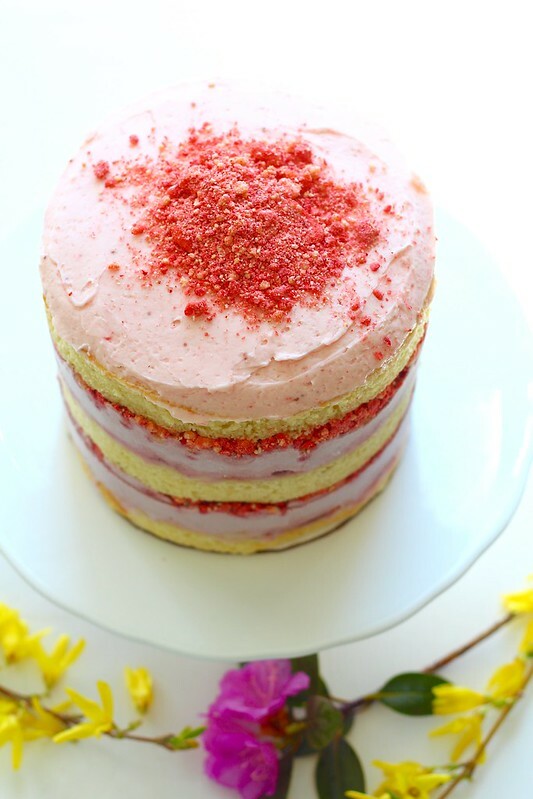 Place the remaining cake layer onto top of the strawberry milk crumb. Top with a thin layer of the frosting. Sprinkle strawberry milk crumb over the top for garnish. Serve. This will last stored and wrapped in the freezer for several weeks. *This will make more strawberry milk than needed for the cake, but you can drink the rest! This is the same recipe for the strawberry milk I have made in the past on the blog.